Trampled on, stomped on, and treated like dirt; your floors take a beating and are often overlooked when it comes to cleaning. The amount of dirt and grime that is drug in from outside is caked all over your floor weather you can visibly see it or not. We are not saying your facilities floors need to be cleaned as often as the bathroom or kitchen, however the floors shouldn’t be easily forgotten. 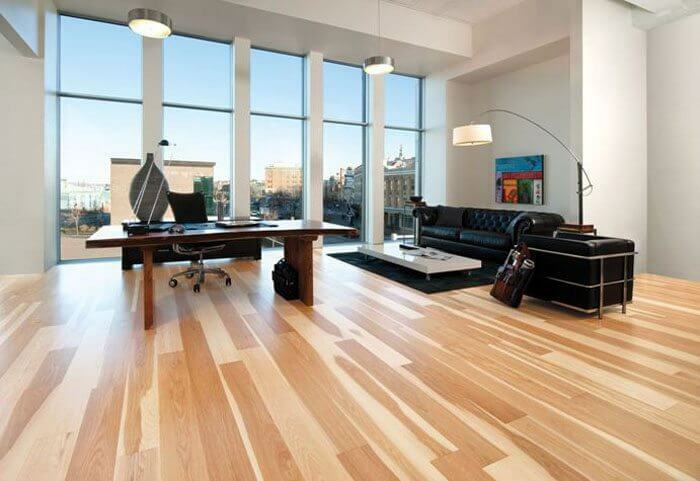 So, how do you clean the floors and what are the differences when it comes to hardwood, laminate, and tile floors? And what floor care equipment and floor cleaning machines are needed for each surface? Before using any cleaner, make sure that your hardwood floors are sealed. How to clean your wood floors is not always dependent on the kind of wood but rather the finish that is on them. If you aren’t sure what sort of finish is on your floors, check with the manufacturer. Our preference is to use a microfiber cloth or microfiber mop on hardwood floors to go along with one of our floor cleaning solutions available at Bortek. While many people love the ease of a mop, which is still a viable option especially in larger spaces, the microfiber cloth is the safe, gentle, and less moisture approach than the mop. For a high gloss finish, we suggest one of our burnisher floor cleaning machines such as the Minuteman Lumina burnisher. All other burnisher floor cleaning machines can be seen here. Cleaning laminate floors with string mops or sponge mops will take you longer, leave streaky marks and because they use a lot of water will make it easier for moisture to sink into the cracks. If moisture gets into the laminate core board it can warp the laminate floors over time. Instead of wet mopping, use a dust mop, soft bristle broom or one of our floor cleaning machines such as the Advance Spectrum 12H vacuum cleaner to remove dust, dirt and loose particles on a regular basis. For slightly damp cleaning, use a spray cleaner onto a cotton, microfiber cloth, or microfiber mop. Follow a few of these tips to keep your laminate floors clean and prevent damage and extend the life of the floor. Ceramic tile floors are a popular flooring option. They’re durable, but like all floors, they need care and cleaning. Here are some smart tips on how to clean tile floors. Sweep or vacuum your tile floors a couple of times a week. Sand and grit can dull and scratch the surface. Once you’ve removed the dirt, you’re ready to mop. Apply one of Bortek’s floor cleaning solutions with a microfiber cloth or microfiber mop instead of a sponge mop. A sponge mop pushes dirty water into the grout and soils it. Change your bucket of cleaning solution often so you won’t have a dirty mop that leaves a cloudy film of dirt on the floor. If you do end up with a hazy film on your tile floor, remove with an all-purpose cleaner. You can then apply a clean cloth to give the tile floor a nice buff dry. One of the most important things in knowing how to clean tile floors is keeping the grout clean. Dirty grout equals dingy-looking floors. Grout is porous and easily absorbs dirt, grease and other materials. Apply a degreaser or natural cleaner to the grout to reach the toughest spots. It’s a good idea to wear gloves when using these types of products. For deep stains, allow the cleaner to sit for 10 minutes. No type of flooring material is truly maintenance free, and the same holds true for concrete. While concrete floors are relatively easy to care for when compared with other types of flooring (such as carpet), they do require regular attention. How much maintenance your floor will need largely depends on the amount of traffic it receives. The maintenance needs of a residential floor will be much different than those for a floor in a high-traffic industrial or retail environment.In most cases, residential concrete floors experience light foot traffic, and a simple cleaning regimen of occasional sweeping and damp mopping will keep them looking like new for many years. For tougher high-traffic areas, we recommend using the HammerHead 450RS. No need to the store for your floor cleaning solutions. Create an account today with Customer Link and access all of these solutions and the entire line of Bortek equipment, parts, rentals, and supplies.